Exercise 12. THE DEAD AND LIVING roadside grasses found in June in California. If you looked at any unirrigated California roadside in June, in full sun you will notice grasses that have died and other grasses that are still green. 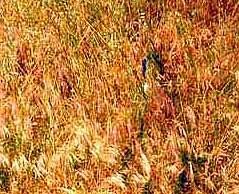 PHOTO of THE GRASSES THAT DIE in summer in California, with a blue-handled trowel as scale. NONE OF THE DEAD GRASSES YOU WILL SEE IN JUNE ARE CALIFORNIA NATIVE GRASSES: they are all annual exotics introduced from Europe and range from 1-4 feet tall. The CALIFORNIA NATIVE GRASSES in the full sun along the roadsides are usually under a foot tall, and will still be green in June, and most will stay green through the summer without irrigation. 1. If you can recognize the exotics (dead) grasses from the potential native Californian (green) grasses in June, how can this knowledge be used to develop a roadside management plan?